Pelikan's history stretches back to 1832 when the chemist Carl Hornemann founded an ink factory in Hanover Germany. The company was subsequently bought by employee Gunter Wangner in 1871. 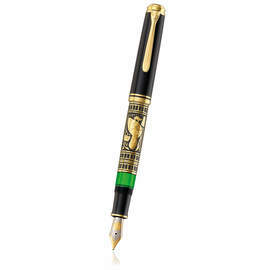 Wangner took his family emblem, a pelican, for the company logo and Pelikan was born. 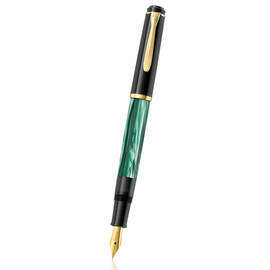 Pelikan produced the first bottle of its well-known Series 4001 fountain pen ink in 1901 and it's first fountain pen in 1929, a pen with Pelikan's now trademark green barrel. 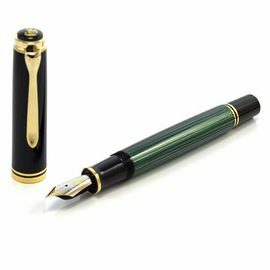 Today the Pelikan Souveran fountain pen collection is regarded as one of the finest ranges of fountain pens in the world. 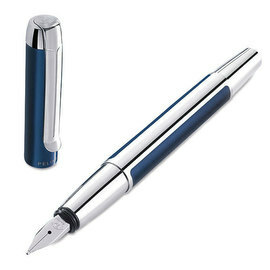 The Epoch series - a recent addition - brings modern German design to the Pelikan range. You will find a review of the Pelikan Pura fountain pen on our blog. 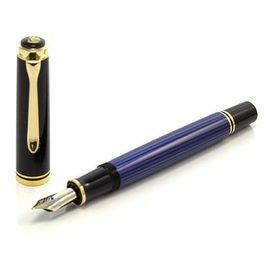 If you cannot find what you are looking for on this page please contact us as we are able to supply you with any item you desire from the Pelikan collection. 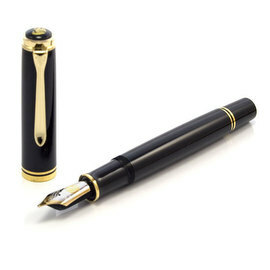 The classic oversize fountain pen revered throughout the world. The classic Pelikan fountain pen revered throughout the world. 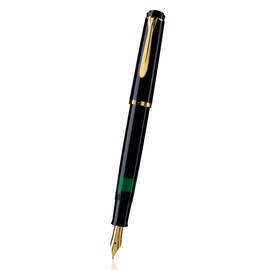 The classic Pelikan fountain pen revered throughout the world, in the medium 600 size. The 400 model presents the second smallest in the Souverän range. Five finishes include bright colours in Pelikan's distinctive striped barrels with black resin and a tortoiseshell finish combined with white resin. The 300 model presents the smallest in the Souverän range. 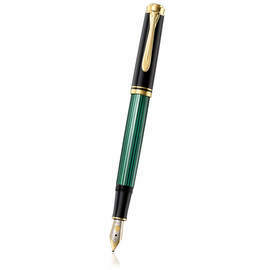 Available in Pelikan's classic green and black striped barrels. 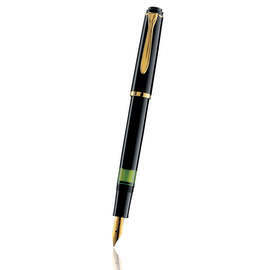 Pelikan's Classic 150 range features high quality glossy black resin with 23 carat gold-plated accents to present the smallest of the Classic models. Pelikan's Classic 200 range features uniquely marbled barrels combined with high quality glossy black resin and includes an entirely black variation. 23 carat gold-plated accents complement all finishes to great effect. Due to popular demand Pelikan have introduced the P200 fountain pen to provide an additional model specifically for use with ink cartridges to the Classic 200 range. High quality glossy black resin combines with 23 carat gold plated accents. 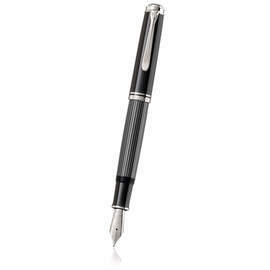 The Pelikan Souverän 1005 offers a palladium-plated silver counterpart to the globally revered oversized Souverän 1000. The distinctive 'Stresemann' finish is named after the stylish anthracite pinstripes of the Nobel Peace Prize winning foreign minister, Gustav Stresemann. 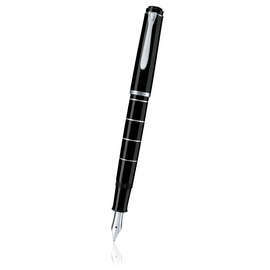 The Pelikan Souverän 805 offers a palladium-plated silver counterpart to the globally revered Souverän 800 range. Three distinctive finishes include the 'Stresemann' finish, named after the stylish anthracite pinstripes of the Nobel Peace Prize winning foreign minister, Gustav Stresemann. The 405 model offers a palladium-plated silver counterpart to the smaller Souverän 400 model, the second smallest in the range. Three distinctive finishes include the 'Stresemann' finish, named after the stylish anthracite pinstripes of the Nobel Peace Prize winning foreign minister, Gustav Stresemann. 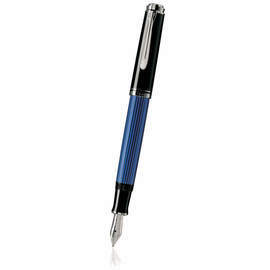 Pelikan's Classic 205 offers a chrome-trimmed counterpart to the Classic 200 range. Available in a white or black glossy resin finish or as a uniquely marbled blue variation. The Classic P205 provides a cartridge-friendly version of the M205 specifically for use with ink cartridges. Glossy black resin combines with chrome-plated accents. The stunning Toledo 900 features ornamentation know as Damascus patterning. A single piece of sterling silver is plated with gold before being engraved by hand, making each motif unique. Due to the complexity and craftsmanship required only 50 pieces can be made each month. The 700 adds a smaller profile to the exquisite Toledo range, which features ornamentation know as Damascus patterning. Thin gold film is pressed onto barrels formed from a single piece of 925 sterling silver before being engraved by hand. A sleek combination of highly polished and matt anodised aluminium in a choice of black, blue or silver. 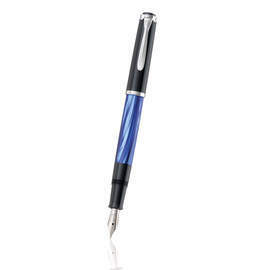 The Pelikan Pura is available as ball pen, rollerball pen and fountain pen. 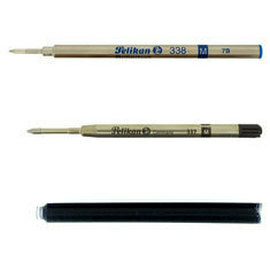 The Pelikan Griffix children's range progresses in 4 stages as the child's writing skills improve. 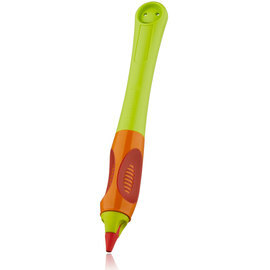 The first stage is a wax crayon pen which can be held in either hand. After the child has determined which hand they use they then progress onto a chunky 2mm pencil available in right or left handed versions, then on to the fibre tip pen and finally on to the fountain pen. The Griffix is available in blue, green, red and pink. 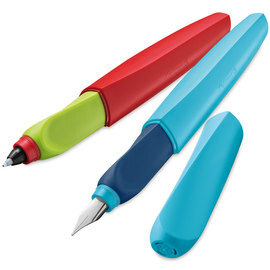 A fun and modern pen with a twist, with an ergonomic grip section and rubberised finish the Twist is suitable for all age ranges. 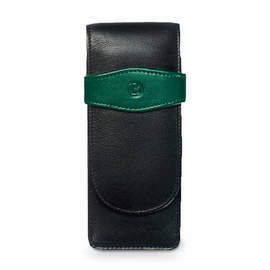 These fine leather pen cases are the ideal choice to safeguard your Pelikan pen.